This type of exercise helps to increase the efficiency with which your body uses oxygen, and regular aerobic exercise can lead to better endurance and better quality of life. Exercises that belong under this heading are walking, running, swimming, stair climbing, hiking, cross-country skiing, cycling, rowing and some types of dancing, among others. It is recommended that you do at least 30 minutes of “cardio” on 5 out of 7 days per week. This can be broken into 10-minute chunks if need be. The intensity of your exercise is important, too. There are a number of different ways to gauge this. The easiest is the “sing-talk-gasp” method; if you can sing while exercising, you need to be working harder. If you’re gasping for air, you should tone it down a bit. If you can carry on a brief conversation, that’s probably about right. You can also use a heart rate monitor, if you know what your target zone is. Your clinic physio can help you figure that out. One more method is the “rating of perceived exertion” scale, which assigns a value between 1 and 10 to descriptive terms, e.g. 1=very light, 5=somewhat hard, 10= very, very hard. Most of your exercise should be in the 4 to 6 range (moderate to hard). Interval training is a good way to improve your endurance, especially if you tend to get very short of breath and/or require supplemental oxygen for exercise. This involves short periods of hard exertion interspersed with longer periods of light effort to help you recover. Even high level athletes benefit from doing at least some of their training in this manner. If you have any questions about aerobic exercise, please ask your CF Clinic physiotherapist. Muscles worked: Pecs, lats, biceps, triceps, upper and lower back muscles, deltoids, quads, hamstrings, glutes, abdominals (i.e. most of your body). Time to complete: 15-20 minutes. It never needs to get any fancier than this, but it certainly can if you’re interested. Strength training can be equally challenging and rewarding for those who pursue it seriously. There are some excellent websites for strength trainers of all levels. A very comprehensive site is www.exrx.net. Both beginners and more experienced exercisers can learn a lot from this site. It includes video demonstrations of hundreds of different exercises, as well as a lot of other useful information. Strength training is most definitely NOT a boys-only activity, and women benefit tremendously from participating in it. There are many websites dedicated to making strength training more approachable to women, and to addressing some training issues that are female-specific: www.stumptuous.com has been around for many years (and is Canadian!) and is a good source of no-nonsense information (albeit with some course language! ); Lift Like A Girl, Girls Gone Strong and Thrive are also very useful sites for women seeking information on strength training. While websites are great, it can be very helpful to work with a qualified trainer when first starting out, as proper execution of strength training movements can help prevent injury and maximize benefit. One caveat with regard to exercise websites: please ignore the nutritional advice! It is meant for the non-CF population, and following it could be very harmful to your health if you are pancreatic insufficient and/or diabetic. The CF Clinic dietician is well qualified to help you adjust your diet to complement your exercise program. Strength training should be done twice a week at minimum, but can be done 5-6 times per week with appropriate program design and nutritional support. Unlike cardio and strength training, stretching (or mobility exercise) doesn’t develop a particular energy system, but this oft-neglected portion of the fitness program can make all the difference between feeling great and feeling gimped. Stretching is of particular importance to people with CF because a lifetime of coughing can wreak havoc on the body! Maintaining muscle length and strength throughout the body can make breathing easier and prevent the pain that comes from bad posture and muscle imbalances (for example, strong abs, weak upper back…many of you know this tune). Yoga and Pilates each help develop flexibility and core stability and can be of great benefit to people with CF, though not all classes are created equal! It is a good idea to tell your instructor that you have CF (if you are comfortable doing this) so that postures can be modified to suit your needs. For example, if you tend to have a lot of heartburn or acid reflux symptoms, it is probably not a great idea to do a lot of inverted (upside down) postures during a yoga class. A good teacher should be able to give you an alternate exercise that will have similar benefit but less risk of flaring up your symptoms. There are also some concerns about hygiene, especially with “hot yoga”, so that particular form is usually not recommended for people with CF. However, if you use your own mat and wash your hands before and after class, most regular yoga and Pilates classes should present little risk. If neither of these is your cup of tea, plain old stretching is just fine. Try to do a little each day, preferably after your cardio or strength training, paying special attention to the chest, torso, lower back and hamstrings. Stretches should be held for 15-30 seconds (no bouncing) and should cause no more than mild discomfort. Overly aggressive stretching can result in injury. www.exrx.net has good descriptions of many stretching exercises, with illustrations. 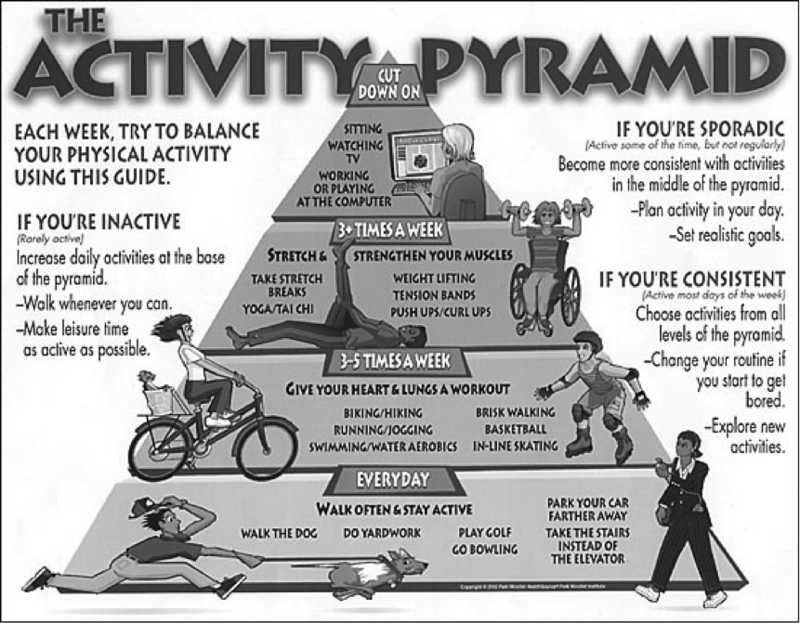 So…how much physical activity is enough? Please ask your CF Clinic physiotherapist if you have more questions about exercise or would like help in developing a program that suits your needs.